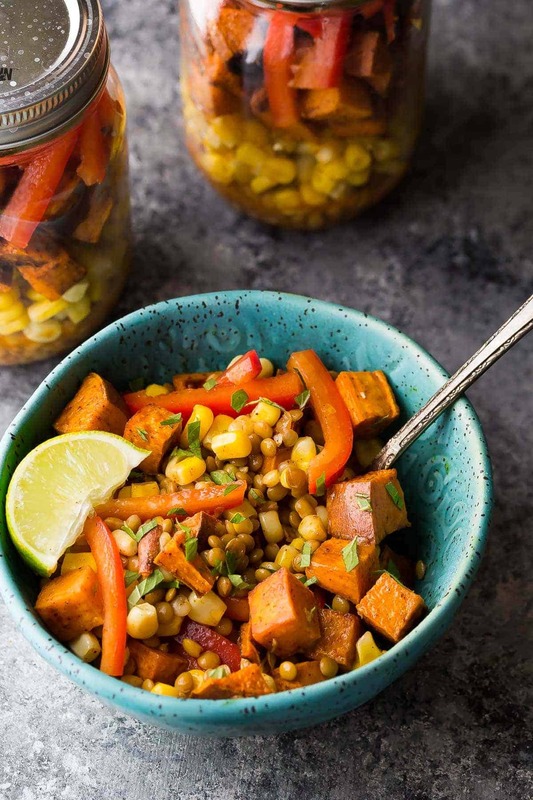 These sweet potato & lentil jar salads have the most amazing chili lime vinaigrette! Make them ahead and enjoy throughout the week for an easy, healthy on-the-go lunch. Now that summer is over and we’re back to the old routine, it’s time for some more make-ahead lunch recipes. Sorry PB&J, as easy as you are, you were so often tossed out in favor of the delicious-looking stuff for sale in the food court. Which honestly, was never as tasty as the picture made out. And left me feeling regret, and hunger just a few hours later. This is why I’ve been on a bit of a mission this past year. Let’s make some easy, healthy lunch recipes that you will actually look forward to, and will never be forgotten in the bottom of your bag, or (gasp) tossed in the trash. 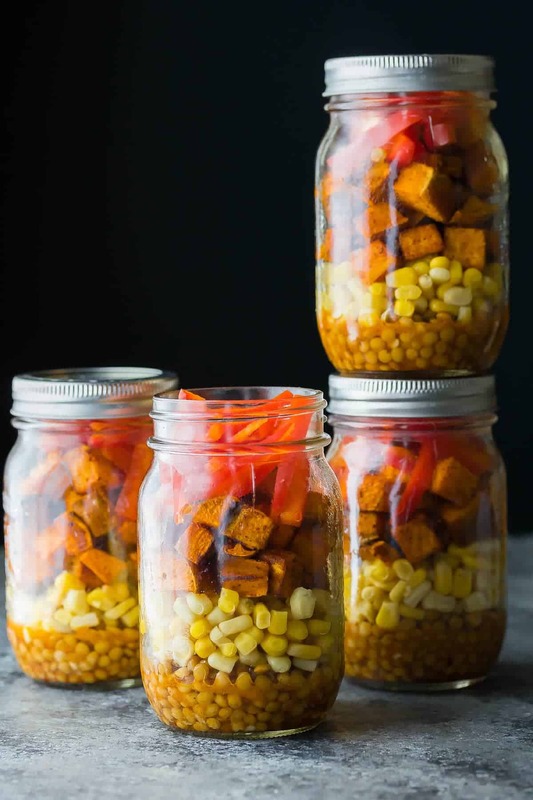 Today’s southwestern sweet potato and lentil jar salads are SUPER easy, delicious and they will actually keep you feeling full a lot longer into the afternoon. Woo hoo! Plus, on the totally superficial side of things, you get to look like a super cool person when you stroll into the lunch room with your rainbow JAR SALAD! And: your super cool jar salad might lead to some stimulating lunch conversations! Them: ‘You are a genius! Teach me your ways’. At least…that’s how it all goes down in my mind. 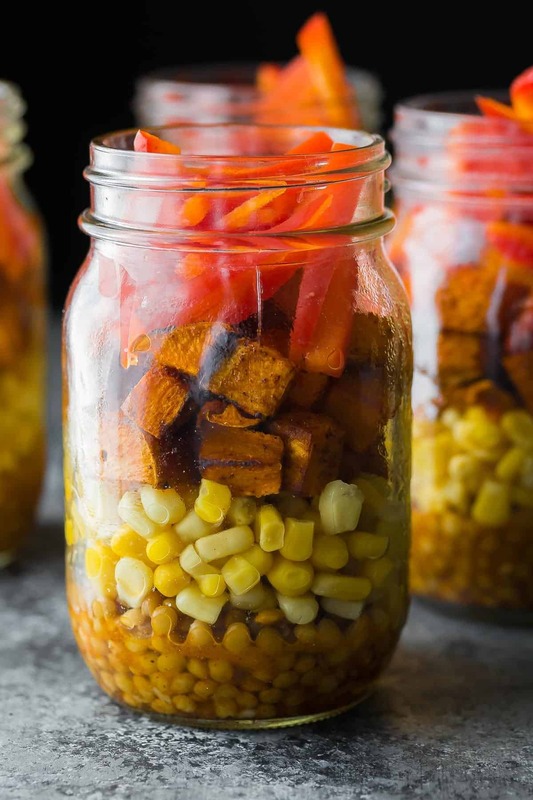 Either way, you are going to enjoy your delicious, FILLING sweet potato and lentil jar salad. It all starts with a simple chili lime vinaigrette, which goes in the bottom of the jars. Next: lentils, then corn, then roasted sweet potato cubes, and finally bell pepper. This lunch is the perfect way to ease back into your routine. I hope you love it as much as I do! More make-ahead lunch recipes for us! Shake together all vinaigrette ingredients and set aside. Heat the oven to 425°F. Toss the sweet potato cubes in the olive oil and chili powder and roast in the oven for 10 minutes, turn, the bake for another 15 minutes or until cooked through. These salads keep for 4 days. I prepped this over the weekend and just ate my first serving, and boy is it delicious! Loooove the dressing and how the sweet potato offsets its tanginess. So delicious and such an easy-to-make recipe. I’m really happy to hear you liked it, Lori! The dressing is one of my faves! So I understand the logic of layering so you dont get mush, but are you supposed to shake this up to coat everything before eating? Hi Matt! Yes! I shake it out into a bowl to eat. If you make it in a large (2 pint) jar you can eat right out of it, but it’s hard to get your fork to the bottom. Great recipe. I used packaged broccoli slaw instead of corn. Is this ate cold or do you heat it up before serving? Hi Michelle, we ate it cold as it is a salad, however it might be good heated? Do the lentils need to be cooked first or are they fine right out of the can? Great recipe. Tried it with white beans as well and loved it! I’m so happy you liked it, Veronique! I don’t eat corn so what would I use as a substitute? Hi Tia! You could use some shredded carrots, cabbage, celery for crunch…any vegetable without too much water content would work really! This is the recipe I adapted from, and I used wild rice in it. I bet wild rice would be amazing in this salad too! I’m new to lentils, so pardon if this is a bad question! I cannot find canned lentils here in my stores. If I get the bagged kind, do they need cooked in any way before assembling the jars? Hi Debbie! Yes, you will need to cook them first. You want to aim for around 2 cups of cooked lentils for this recipe. Hope you enjoy it! 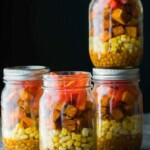 Hi Denise, this recipe looks so yummy….what size mason jars should I use…? Hi Kathy, I love 2 cup/ 1 pint mason jars. Hi Cindy, I do recommend that it be refrigerated (long term), however it should be OK at room temperature for a few hours. This is going to be my next go to jar salad! Love everything about this! I love your jar salads, Denise! They’re always so beautiful and filled with lots of veggies. I often forget about lentils, so I’m loving this dish! And sweet potatoes are quickly becoming a new favorite of mine, too. Yum!! Denise you do the most creative things with lentils!! They are such an under used ingredient! I can’t wait to make these, I have gotten so bad about not eating much of anything during the day and I need to do better! I’m obsessed with salad and noodle soup jars! They seriously make the best lunches! Totally!! It’s nice to have a guilt-free healthy lunch 🙂 Thanks, Medha!